www.audifans.net :: View topic - Show me your baby! 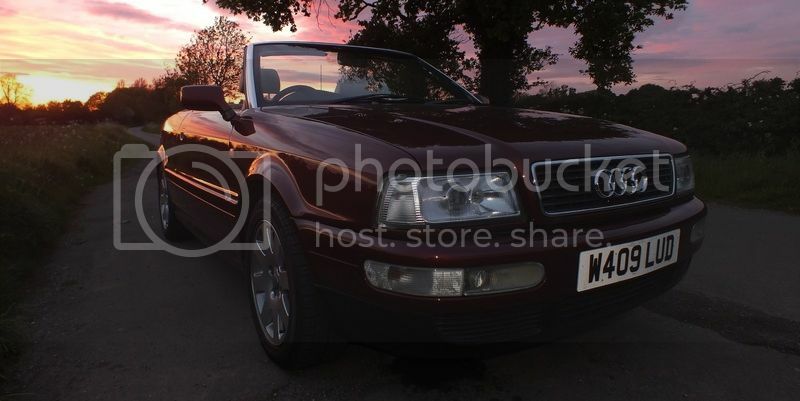 A lot of other forums I am on have dedicated picture threads for their cars, I figured why not start one here so we can all check out each others cars as I am always interested in seeing more pics of cabriolets! you never know, if it becomes a good thread it might sticky? Those deep dish rims look brilliant on these cars, cracking example you've got there. Lip spoiler on the boot is also subtle and effective. Weather has been horrendous here recently, been meaning to get my cab cleaned up and get some decent snaps of it! Scenery around where I live provides some cracking background drops so will defo get onto it at some point. Hope some other members clock this thread and start to add to the scenery! I hope to see more people post some pics on here, its good to see some of the different cars knocking around and some of the mods people do to them, as well as shots in different lights. I see you wrapped yours, bet that makes a rare sight, I haven't seen any cabs in white in the flesh this side of the pond. Yeah I gotta admit it does look great when the sun hits it - there is a sparkly effect throughout that really sets it off without it looking "blingy". Going off topic but I had a nosey through your photobucket album (came up accidentally when I clicked on the thread pic) and spotted the KW coilover setup you are running. Being considering this for ages, the KW site has them for 1199 euros, around £885 with the current exchange rate. Did you have to request shipping to here? It doesn't come up in any of the options.. I got them via a trader called Yaz on the S2forum, took 3 weeks as they are custom made, but I wholly recommend them, he got me a really good rate and sorted delivery, etc... if you have a look at my thread over there under cabriolets you will find his details. Nice one, thanks for the heads up..had a look on s2forum and found the cabby section but not sure what thread you are on about? Will defo register later tonight and give him a shout..and sods law, that top thread was the only one I never looked at!! That said, I've also fired an email to Tonks 4x4 for an S2 conversion quote, once I get word back I'll need to check that I can use the original running gear. I'm guessing I might need to get an S2 setup. Aint researched it fully yet, but I'm guessing the driveshafts I will be using would be a different length meaning the B4 OEM running gear has to go?